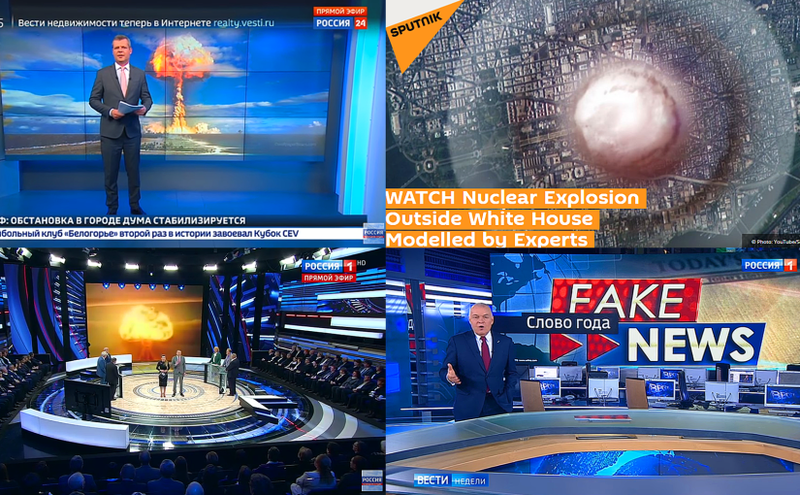 The Kremlin’s reaction to Trump’s Syria strikes could be dissected to examine the modus operandi utilized by the Russian state media to conduct successful info-ops. Whenever possible, the Kremlin and the Russian state media attempt to preemptively muddy the waters with respect to any potentially sensitive topic. When certain events are inevitable, the Kremlin predicts them in a way most beneficial to the regime. For example, Putin warned about possible “chemical weapons provocations by the rebels,” knowing Assad’s propensity for using them. Thus, such a warning is an evergreen fig leaf, to be used by the Kremlin as needed. With respect to Trump’s motives, impugning them was easy. Once Trump Tweeted out his intent to conduct a series of strikes on Syria, the Russian state media asserted that Trump ordered the strikes to distract from the raid of his attorney’s office, his alleged affair with Stormy Daniels and Mueller’s investigation in general. This was a low-hanging fruit and the Kremlin plucked it with great ease – convincing not only domestic audiences, but also those in the West. In a more general sense, the Kremlin has been laying the groundwork for its info-ops against the West for years, developing the general mistrust of the government and media. RT’s editor-in-chief, Margarita Simonyan, admitted that RT was created as an instrument to be used by the Kremlin for its info-wars against the West, as needed. In the meantime, the West is lagging far behind, having been caught unprepared for the onslaught of the fake news, encompassing a wide variety of topics, from Ebola to the election. While the Congress has allocated $120 million since 2016 to combat foreign propaganda, none of it was spent to counter foreign efforts to meddle in elections or sow distrust in democracy. Who wouldn’t want to get along with Russia, if the only alternative was to end up reduced to a pile of radioactive ash? That’s how the Kremlin’s mouthpieces aim to make you feel. This is not a new narrative, but a trusty saber that is being rattled as needed. The Kremlin wants the average Western citizens to be so exhausted by the possibility of World War III that they would pressure their governments to get along with Russia, at any cost. That is the strategy frequently discussed on Russian state television, as well as the main aim of the nuclear saber-rattling. In any scenario, the Kremlin’s media tentacles reach into the public conscience and build the momentum for the actions Putin’s government has been contemplating all along. For example, the Ukrainian revolution was used as the pretext for annexing Crimea, which was quietly contemplated for years. The idea of providing S-300 or S-400 anti-aircraft missile systems to Assad has been floated in the Russian state media prior to the strikes. Russian pundits and politicians publicly relished the idea of turning Syria into another Vietnam for Americans. State Duma deputy Leonid Kalashnikov says Russia should supply S-300, S-400 to Assad, the same way the USSR sent surface-to-air missiles to Vietnam, and let #Syria knock American bombers out of the sky. Nonetheless, the strikes are now being used as the pretext for “removing moral obligations” not to supply Assad with such systems. In short, Russia is prepared to use any situation to further its prior objectives, with the media working to provide the perceived justification, while clouding the collective conscience. When Russia’s election meddling was widely exposed – instead of shying away from the topic, the Kremlin’s state media openly boasted: “Trump is ours”! For the umpteenth time, Russian state TV host exclaims "Trump is ours." Russian politicians and pundits are continuing to reiterate that Trump is the most pro-Russian politician in the U.S. establishment. The Russians are already being sanctioned for election meddling and don’t have much to lose by using the situation to their advantage, thus cementing the idea of Putin’s omnipotence and Russia’s growing worldwide influence. In every large-scale confrontation, Russia is positioning itself as the brave Soviet soldier and its opponents as the Nazis. The Kremlin is repeatedly engaging in large-scale demonstrations of Godwin’s law: invoke the Nazis and you’ve lost the argument. Undeterred by this principle, the Russians continue to resort to this tactic. Ukrainians opposing Russian aggression are labeled as the Nazis and Trump, who approved the strikes on Syria, is the new Hitler. The Russian media, having threatened to reduce the world to piles of radioactive ash, says that silly Trump is “playing toy soldiers” and trying to start WWIII, but “wise and calm” Putin saved the world by not responding. Politicians and pundits propose a variety of retaliatory measures, including expanded information warfare operations. Russia claims to be winning, regardless of the facts on the ground. When the West imposed the sanctions for the annexation of Ukraine’s Crimea, the Russian media portrayed them as a measure that is good for Russia and bad for the West. Russian state media promoted T-shirts that said: “Sanctions? Don’t make my Iskanders laugh.” “Iskander” is a missile complex, capable of carrying a nuclear warhead. The typical message of defiance was combined with the customary nuclear saber-rattling. The Iskanders no longer seem to be laughing, as the sanctions are biting hard, but first impressions do count. By the same token, when the Trump administration announced its decision to expel 60 Russian spies from the U.S., the Russian state media was quick to point out that an unidentified senior Trump administration official reportedly comforted the Russians by telling them that the number of Russian diplomatic staff in the U.S. is not being cut and 60 expelled spies could be replaced by others. The Russian media took full advantage of the situation, mocking the move as a hollow gesture. "Can we send them the ones expelled from the UK and Europe?" Russia’s use of bots and trolls has been extensively covered in the media. One aspect of Russia’s info-war operations includes the creation of anonymous social media accounts, purporting to “uncover” covert pro-Kremlin operators and trolls, while striving to attack those who debunk Russian propaganda, to splinter the “resistance” and to undermine pro-Ukrainian movements in the social media. Any accounts that attack anti-Kremlin individuals under the guise of “exposing them” should be taken with a pound of salt. While these underhanded tactics yield some fruit, the key to the Kremlin’s info-wars is convincing and/or recruiting real celebrities and large-scale influencers to openly run with the Russian version of the narrative. In the past, Russian state media simply used Photoshopped images to project the idea of celebrities supporting Putin. For example, Sputnik and other Russian state media outlets published a story that quoted Rammstein singer Till Lindemann, allegedly speaking out in support of Putin and lashing out against Western sanctions. According to Sputnik, Lindemann said that Putin is more popular in Germany than Angela Merkel. 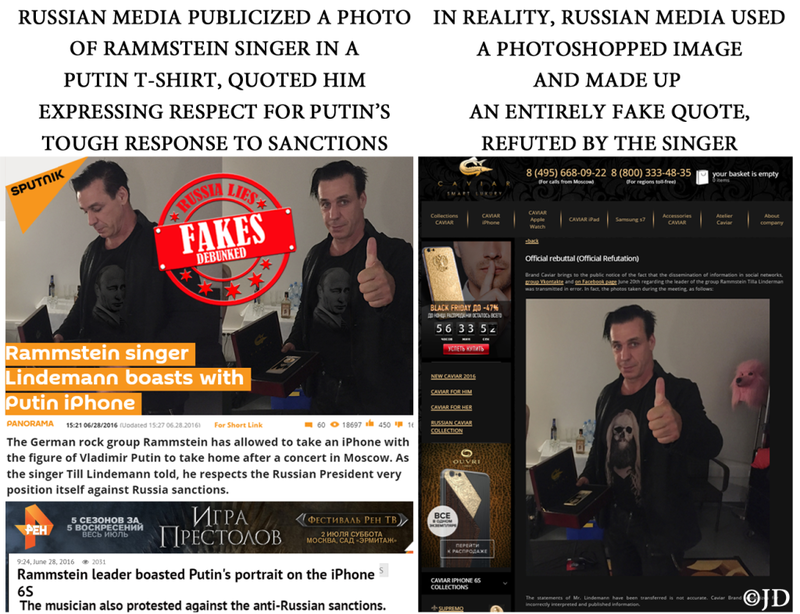 Sputnik also published a Photoshopped picture of the singer in a Putin T-shirt. Photoshop isn’t necessary, when Russia can recruit or use real influencers or celebrities. Appearing on Russian state TV show ’60 Minutes,’ RT’s editor-in-chief Margarita Simonyan said, in relevant part: “Regular people – among whom there are people who have more influence on public opinion than the government – they are the ones we’re trying to reach. 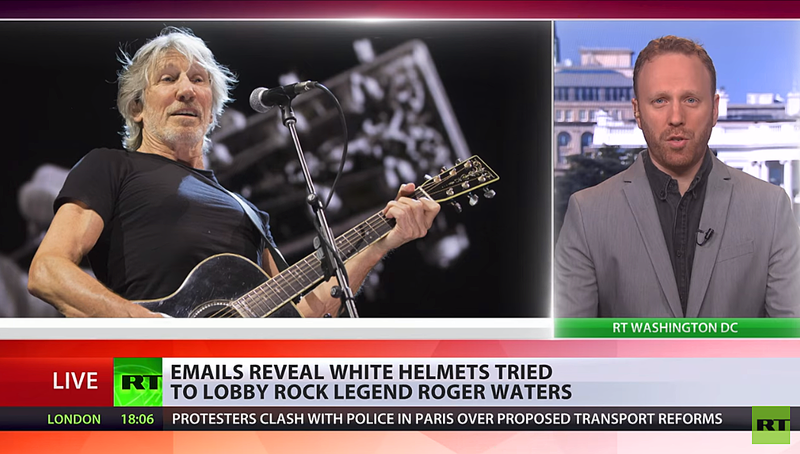 Look at Roger Waters of Pink Floyd… Those are the people who have nowhere else to find this information, except for us [RT].” During his Barcelona concert, Waters denounced “the White Helmets” as a “fake organization,” much to the delight of the Russian state media. He later provided copies of e-mail communications to be used by RT in its programming. After bringing up Waters, Simonyan boasted about her discussions with an unnamed top-level manager of a major international multimedia platform. She proudly claimed to have convinced this high-ranking individual [presumably, an American] to accept the Kremlin’s perspective on the annexation of Crimea. “He didn’t know anything about it, but now he understands,” Simonyan said. She emphasized the importance of spreading the Russian narrative in multiple languages, which is currently being done only by RT and Sputnik (sister companies, with Simonyan serving as the editor-in-chief of both). As the Kremlin increases its info-war operations, another English-language “media” company is about to appear on the Western front. “USA Really” was created by Russia’s Federal News Agency, linked to the IRA troll factory operations. The stated goal of “USA Really” is to spread “information and problems that are hushed up” by the American mainstream media. It is essentially the same model that has proven to be quite effective for RT and Sputnik. Trump’s narrative about the untrustworthy “fake news media” plays right into the hands of the Kremlin’s bullhorns. By undermining public trust in traditional news sources, Russian state media promotes itself as an “alternative” source of news. As an expression goes, “If you build it, they will come” and if you write it, they will believe – as Margarita Simonyan opined during one of her many appearances on Russian state media talk shows. 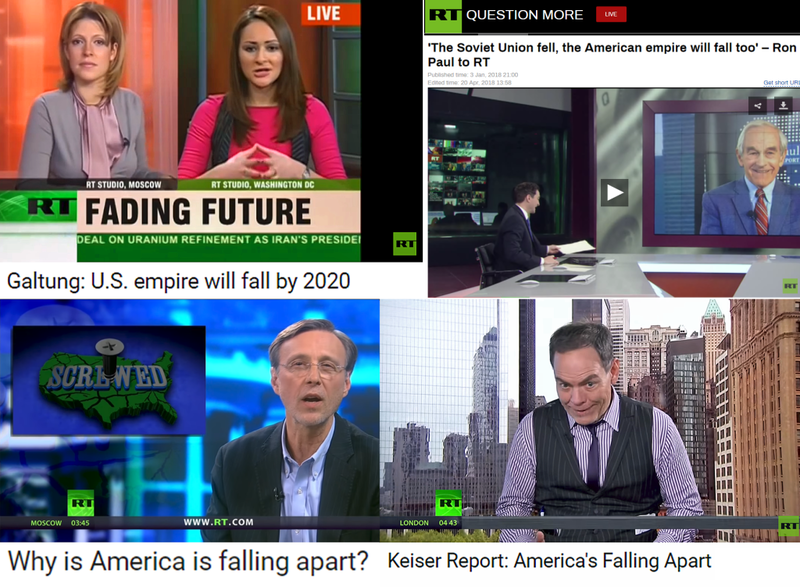 The Western audiences are so receptive to the Russian propaganda in large part due to the dismal media coverage of the Kremlin in the recent past. Many Americans are blissfully unaware that Putin’s Russia is not our friend and is hoping for our ultimate destruction. Editor-in-chief of RT and Sputnik, Margarita Simonyan, isn’t striving to bring you the “alternative news.” She’s working hard to fill the information space with propaganda, while asserting that Americans are so dumb and uneducated, they’ll believe anything. It’s not a coincidence that RT and Sputnik have such a hard time finding anything remotely positive to report about the U.S. It should be noted that without a willing participant in the White House, the Kremlin’s info-ops would be notably less effective. Trump’s “fatal ineptitude” (a fitting expression, coined on a Russian state TV show ’60 Minutes’) is a deciding factor that fits into the pyramid of convincing lies like a missing piece of a puzzle. Trump’s continued kowtowing to the Russians puts a cherry atop a poisoned ice cream sundae of Putin’s propaganda. Without adequate countermeasures, Russian information warfare will continue to advance.